St. Edmunds Bacon Factory Ltd.
ON A COLD DAY IN 1910 a group of Suffolk farmers met in Bury St. Edmunds. Outside a biting wind attacked passers-by. The reign of King Edward the VII was slowly drawing to a close. Inside the cold wind of economic change was causing the farmers concern. All of them specialised in raising pigs. They knew their business and the pigs they raised were of good quality. But when it came to selling them—now that was a different matter. There were only two ways, through the market or direct to the butcher. One man who was not satisfied with this situation was Mr. T. F.. Robinson of Woolpit. It was he who had arranged the meeting and by the lime it ended the farmers had adopted his resolution: they would start their own pig factory and sell their pigs to the factory. 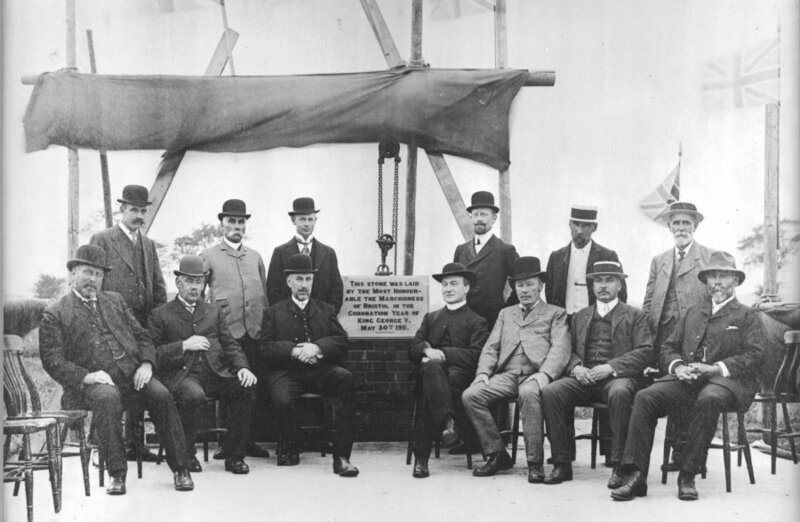 In 1911 the foundation stone of the St. Edmunds Bacon Factory was laid at Elmswell. The farmers who formed the company were men of strong character, as their photograph shows, but they realised they could not launch an enterprise of this size without expert advice. They sent one of the members to Denmark to study the new Danish methods of production. When the architect’s plan for the factory was being discussed they brought a Danish expert to Elmswell to advise them. Rapidly the factory grew from its foundations until the work was completed towards the end of 1911. In those early days about 230 pigs a week were processed through the factory. They came from the farms by rail, on foot or by horse-drawn cart. It was not unusual to see the whole of the driveway to St. Edmunds’ factory thronged with a long line of carts waiting to unload their pigs. The pigs were killed and sold as green bacon on the London Provision Exchange. A few sausages and pies were also made and these were sold at a small St. Edmunds shop adjacent to the factory. The new king, George V. was one of their first customers. Throughout the 1914-18 war St. Edmunds flourished. The rugged individualists who had co-operated in St. Edmunds had the satisfaction of seeing a new business growing to success in Suffolk. St. Edmunds was then, and still is now, a somewhat unusual concern. St. Edmunds is the only independent farmer-owned co-operative pig factory in Great Britain. When those farming pioneers started at St. Edmunds they started a new idea in co-operative marketing. St. Edmunds is a joint enterprise between the pig fanner and the factory, with shareholdings limited in size and the dividend limited as well. It is a provident society, run by a committee with an elected chairman. The fact that St. Edmunds has lasted for over half a century and grown considerably during this time is proof of the strength of the idea of those early pioneers. secret of the fine mild St Edmunds Bacon taste lies in this process. In the years between the wars St. Edmunds continued to grow. More pigs were processed than ever before. 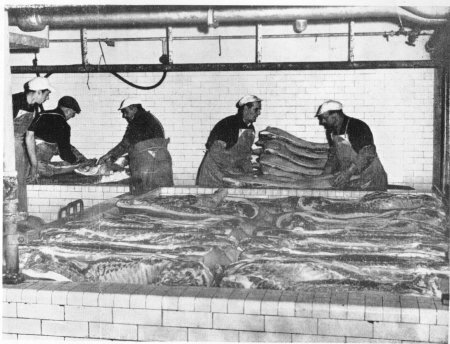 In 1926 the factory began to produce pork as well as bacon. In the same year David Black became Chairman of the Committee. He was a local Suffolk farmer, but his skill and experience took the company through some of its most profitable years. He was Chairman from 1926 to 1934 and throughout the whole period of rationing and controls from 1941 to 1956. His knowledge of the bacon trade, a particularly tricky one to muster, was a crucial factor in laying the strong foundations which enabled St. Edmunds to withstand the set-backs that were to come. Under David Black’s chairmanship St. Edmunds went from strength to strength. Then in 1954 came the end of rationing controls. St. Edmunds tried to return to their old pre-war lines. But trading conditions had changed. Foreign bacon producers saw England as a rich market for their produce. The Danes successfully invaded the British market with considerable skill and a heavily financed advertising campaign. Other countries followed and the situation became very difficult for the home curer. Some smaller concerns went into liquidation, all felt the pinch. But the spirit of enterprise and initiative that had inspired the early founders was still strong. St. Edmunds took a good look at itself, at the market conditions, and decided to accept the challenge. They determined to diversify, modernise, and improve their products. No longer would they sell all their produce on the London Provision Exchange; they would sell some of their goods direct to retailers and wholesalers. They employed a sales staff and put a van sales service into operation. The areas they covered were Norfolk, Suffolk and Cambridge. So successful has this scheme been that today St. Edmunds branded products are sold in the Midlands, with a depot at Coventry, and in London, with a depot at Romford. New long distance refrigerated trucks now carry St. Edmunds products through the night to new depots in Norwich, King’s Lynn and London. With changes in the method of distribution came diversification in the products themselves. St. Edmunds decided to expand the range of their small goods: sausages, pork pies, gammons, and they purchased new vacuum-packing equipment to enable them to satisfy the growing demand for high quality prepacked bacon. Nor has this process stood still. Even within the last two months St. Edmunds, after some months of experimentation, have launched a brand new product. This is the St. Edmunds Bacon Flip, a type of baconburger. St Edmunds produce a wide range of pork and bacon products, from pork pies to complete sides of bacon. 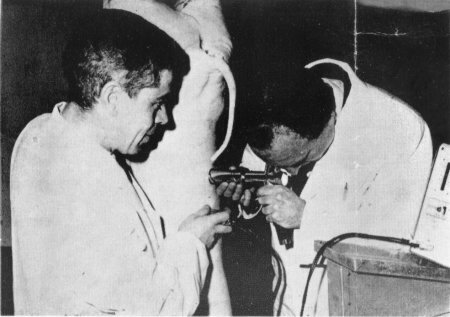 lean on a pig carcass with special scientific measuring equipment. Together with these changes in the product and distribution came a determined counter-attack against the invasion of foreign bacon. Good British bacon was as good as, if not better than, imported bacon. The trouble was that there was not enough good quality bacon, and its quality was not consistent. The housewife who bought British bacon could have the best quality one day, and a lower quality the next. The root of the difficulty was that there were no proper grading standards. St. Edmunds immediately set about remedying this with the introduction of scientific measuring devices to provide accurate grading. The intrascope is a probe which measures the depth of fat. The ultrasonic machine, based on the wartime Asdic principle, measures the amount of leanness to within 2mm. But the real need was for an agreement on new grading standards. St. Edmunds and other leading British bacon curers co-operated with the County Quality Bacon Federation to ensure high quality bacon of a consistent standard. In addition, while St. Edmunds sought to improve standards, they also encouraged the pig farmer to rear a better quality pig. They give a bonus to the pig farmer who produces a quality pig. Their unique position as a farmer-owned factory has enabled them to co-operate to a very close degree with the pig farmer to produce a better pig, and thus better pork and bacon for the consumer. The present chairman of St. Edmunds, Lt.-Col. J. E. B. Freeman, typifies this new and more aggressive approach. After a short career in the law he turned to soldiering, and fought with distinction in the war. He then settled in East Anglia and soon became immersed in new methods of pig farming. He became personally closely associated with the drive to develop a better pig, the Q (for quality) bacon or pork pigs. It was perhaps natural that in changing times the company should seek new leadership and Col. Freeman became chairman three years ago. Most of these recent innovations have taken place under his guidance and with the help of Brian Richmond, who joined St. Edmunds as General Manager in 1960, and whose unfortunate death last year was a great shock to all at the factory. Mr. K. C. Crook was appointed the new General Manager in September last year. A marketing and management expert, he has joined St. Edmunds after experience in management, works study, engineering, and even running his own business. With such men in charge St. Edmunds seems assured of an exciting new future, after shedding the slough of the old bacon marketing methods. Today St. Edmunds can look back on fifty years of trading. They have been years of success, challenge, and readjustment to a changing world. But the pioneer spirit of those founder farmers is still strong in St. Edmunds, and it seems that Great Britain’s only independent, farmer owned, co-operative pig factory is all set for new achievements in a world its founders can never have envisaged.